Come on back to the garden with me, we are in the middle of harvesting tomatoes, peppers, squash, green beans and corn. It is so much fun to pick the fresh vegetables from the garden then head straight to the kitchen and create a delicious summer dish. We will just sit for a little bit and have some nice Herb Tea and talk about the menu for next week. When you are making you meal plan for the week do you try to include some fresh vegetables from your garden, or a farmers market? Have you ever participated in a CSA where the farmer or grower will deliver a box of seasonal fruits and vegetables to your home each week? I am so glad that you were able to stop by today and spend some time in the garden with us. I have a lovely basket of vegetables for you to take home with you. Hope you have a wonderful week and come back to see us real soon! All of a sudden I stopped receiving your E-mails and I was upset. I love your recipes!!!! This morning I received this E-mail and I am happier than ever. I don't know what happened but I am very, very happy, thank you. You are so welcome, I am happy that you are receiving the email again. Thanks for your comment it is always great to hear from my readers! Hope you have a great weekend! Lots of good food for the week! You are making me hungry! The Picnic Cake sounds delicious! These all look so delicious!! I especially like the Summer Harvest Bread...yum! Everything looks incredible! I especially have my eye on those ribs and the blackberry cobbler. A week of great meals! Thank you for linking at the In and Out of the Kitchen Link Party. Hope to see you again next week. 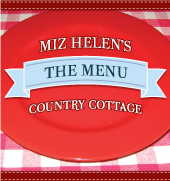 Another lovely menu plan, Miz Helen! I'm especially drawn to your delicious salads in this hot weather. Pinned to my Menu Planning Board on Pinterest. Thank you for sharing with the Hearth and Soul hop. Looks great! Thank you so much for linking up at Tasty Tuesday! Your recipe has been pinned to the Tasty Tuesday Pinterest board! Please join us again this week!